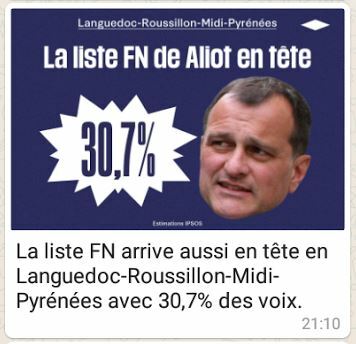 Leading French national newspaper, Libération, carried out an experiment for the 2015 regional elections that allowed users to connect with them on WhatsApp for live, rolling news and analysis of the results as they came in. On the face of it, this is a great idea and a fantastic use of the platform to keep specific audiences up to date. This is my experience on how the experiment worked on the night from a user point of view. For background, I use social platforms a lot and consider myself an advanced user of WhatsApp. 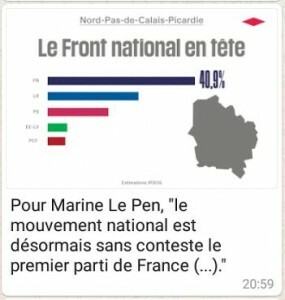 Full instructions of how to register were given on their website ( http://www.liberation.fr/france/2015/12/03/suivez-les-elections-regionales-sur-whatsapp-avec-liberation_1418031 ). I registered in advance on 3 December. The two blue ticks appear next to the message – so I can see that it has been received and read. 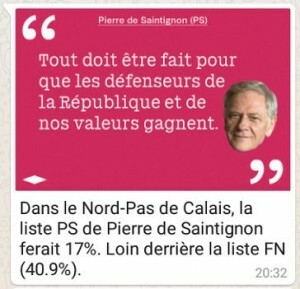 Although it is all straight forward, asking people to type the message “Je souhaite être tenu informé des élections régionales sur WhatsApp” is cumbersome – it could have just been “régionales” or “régionales2015” or anything that was much shorter. I know it starts because I saw one of the messages Libération sent on Twitter. I didn’t see anything on WhatsApp. So, that is what happened but what about the content? 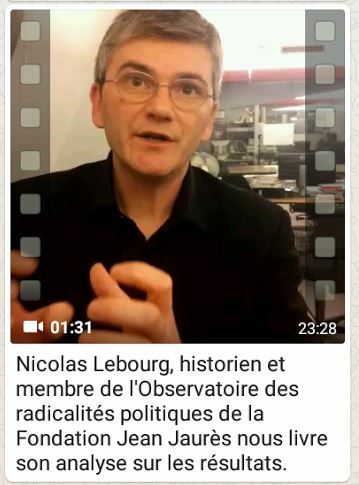 The contributions from Sybille Vincendon (journalist at Libération), Laurent Joffrin (director of Libération) and Nicholas Lebourg (historian) were a great use of the platform – Lebourg came across particularly well. However, there were a number of issues. 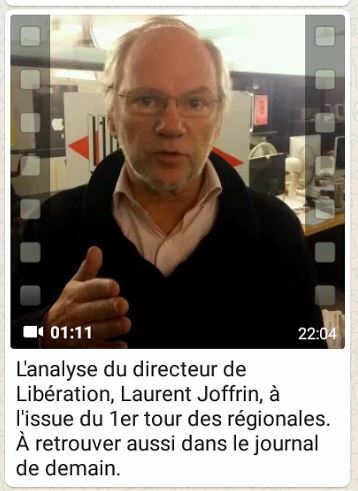 Laurent Joffrin’s video underlined the point – he was stood directly in front of a Libération logo. You could not see it but, if you were looking out for it, you could just make it out. 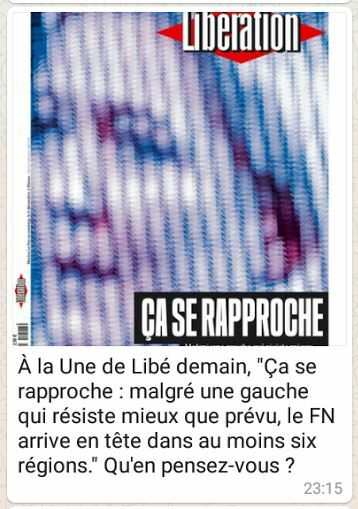 The only other Libé logo we saw was on the front page graphic at 11.15pm. This was a huge wasted opportunity. Every ‘talking head’ should have a logo very visible in the background. The backgrounds were uninspiring – from a newsroom that seemed lifeless and unlike any newsroom I have ever seen before to an empty room. Lebourg’s video looked as if he had been caught in a corridor on his way somewhere – and that worked. 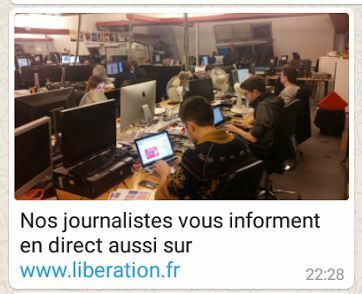 Libération should pick backgrounds that make it look exciting and vibrant and, if necessary, tell people how to act in the background to portray that image. The quality of the content – words, sounds and pictures – was great. There was not enough, though, and it would have been nice to have some other viewpoints. On election night, it should not be too hard to find a politician! There was none! WhatsApp has the ability to send audio and it would have been good to have some soundbites recorded down the phoneline from politicians and commentators. It may be a matter of personal taste but I found the ‘floating head’ graphics with the ‘flash’ numbers a bit amateur. I am not sure that they fit well within the style and tone of the paper. 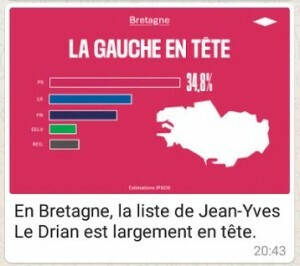 The bar chart/map graphics were functional and clear – again, there were not enough of them. Out of 12 messages that I received, only two were text and one of them was to say goodbye! In a fast moving news event such as election night, you would expect a lot more text only content. 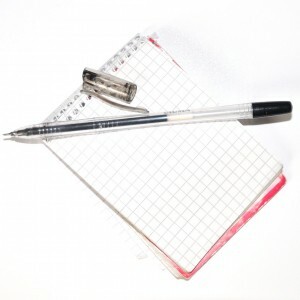 Text is often ignored in a digital environment but it should not be. It is quick and functional. On election night, you expect a lot of coverage and you expect it to keep coming at you. When an organisation sets up a channel especially for political obsessives (and I am one! ), you would expect even more coverage. WhatsApp is an inspired choice of platform for this kind of focussed rolling news event. However, I don’t think it was used to its full potential. Even at the most basic, there was not one message for every region with their results – that was surprising. 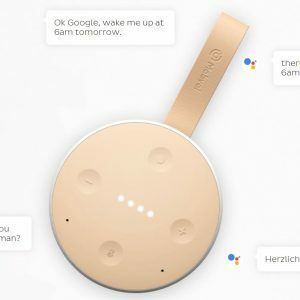 A lot of this could be planned in advance – you know you have a set number of regions so you need to produce a results message, a set of quotes from each camp, maybe one or two pieces of audio per region, maybe a ‘talking head’ giving a quick commentary on each region’s results. And branding. Lots of branding. 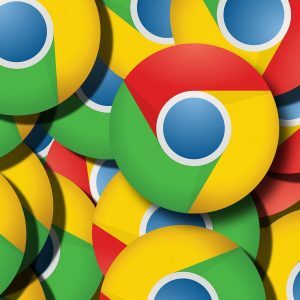 Those quotes can be taken from articles and interviews that will appear in the next day’s paper – with regular reminders that more coverage is available in the paper – to sell more papers. At the end of the day, that is what it is about. Providing an online service to show how great, how groundbreaking, how inspiring and how exciting the paper is. I have been quite hard on Libé in this blog – and, on one level, I want to be. I think that last night’s WhatsApp experiment didn’t work. It could have been so much better. It was a massive story – and without making a judgment on the results, it was historic. There was so much opportunity there and, in my opinion, it fell flat. Too little content, too slowly delivered. Twitter was a much better news source last night – as it often is during these things. 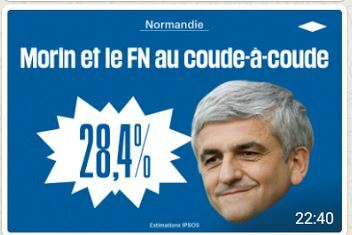 So, it might sound a bit odd for me now to congratulate Libé. Actually, it sounds really odd. However, they took a chance to do something different and they took that chance in full view of anyone that wanted to watch. OK, so it didn’t work but they will now be able to learn by looking at what did and what didn’t. They will be able to consider how to ensure that the branding is there, that there is more content and more engagement. And for that, they deserve huge congratulations. The big question is now how they will deal with the second round. It’s a bigger story and with more potential content. This is such a great opportunity for Libé – I hope they take it. 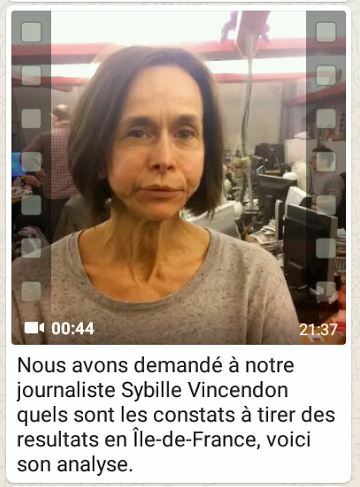 One week later, Libération continued their experiment. You can see how they did and what, if anything, changed by reading my blog here. Facebook Fatigue – is it a thing?